I couldn't imagine my aviary without the delightful little Waxbills in it. Over the years I have learned to really appreciate the Waxbills for what they are and not for the stereotypes placed on them. 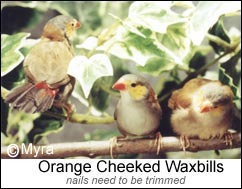 I was very leery before buying my first few Orange Cheek Waxbills. I had heard they were weak, timid, frail little birds that wouldn't do well in a mixed aviary. But the little birds kept calling me back to see them until I couldn't resist any more. As suggested I started out with a small flock of very social Waxbills, six individuals in total from three different breeders. I watched them interact with each other and the other finches for weeks. They proved to be very outgoing, curious, and energetic. However, I have come to understand them better and learned more about their care in the many years since. Waxbills are not like Zebras, Society, Nuns and other common pet store birds. Their diet and housing requirements should be taken into consideration before to decide to bring them into your home. They will not thrive in a small cage eating only finch seed, while in the corner of your living room. Waxbills originate from the grasslands of Africa. Understanding their native environment is essential to providing them with the best possible care in your home whether you plan to breed or not. Temperature, housing, lighting and diet are very important to the Waxbills. Temperature needs to be at least 60 Fahrenheit, even higher for some species. 60 degrees is the minimum temperature you should expose your Waxbills to. The 70's and 80's are ideal. 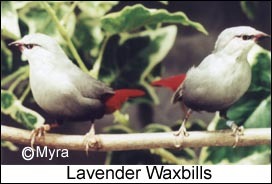 Waxbill breeders do use both indoor and outdoor aviaries, depending on the climate in their area. Those who do live in colder climates say you should keep the aviary free of cold drafts. Waxbills naturally use the grasslands to find food, build nests, and hide from predators. A planted aviary or at least some dried grass bundles for them to hide in will make your aviary or flight cage feel all the more like home and provide a place to raise a family someday. My Waxbills are all kept indoors. I house many of them in a community aviary and breeding pairs in cages. My breeding cages are 2'x2'x3' and all have some plastic plants inside to give the Waxbills a place to hide and a feeling of security. Waxbill breeding works best in single pair breeding cages for most species. Lighting should either be natural lighting, artificial full spectrum lighting, or a combination of both. They should get at least 12 hours of light a day. I use both sources of light in my aviary with the artificial lights on a timer. Naturally here in Iowa during the winters the hours of daylight diminish steadily so I rely on my artificial lights a lot. My lights turn on shortly before sunset so the birds aren't startled by the sudden change in light. A good seed mix works for the basic diet but it should be supplemented with extra grass seeds, egg food, fresh sprouts, and live food. The live food is what turns most people away from Waxbills. Granted the bugs and worms can get away before they are eaten but it's uncommon and not usually much a problem. I have found that some will do very well without live food if given a high protein diet. However I haven�t seen Waxbills breed without the live food. Vitamin and mineral additives may also be used in addition to their regular diet. Occasionally I give all my finches extra greens such as broccoli, brussel sprouts and cabbage. When I'm feeling very ambitious I'll provide a little cooked green beans, peas, and white rice. These aren't always necessary and shouldn't be given in excess to any finch but all of my finches do enjoy the treat. Cuttlefish bone, oyster shell, and baked chicken egg shell is also given to aid in the digestion of their regular foods and to maintain normal calcium levels for egg laying hens. Water additives like Calcium Plus and Calciboost can be given. Always read and follow the instructions and dosage guides on these supplements before adding them to your finches diet. Clean drinking water must always be made available, and like most finches in my experience, as soon as you put fresh water in they'll jump in for a little bath. When they finish, replace the water again. All that and it's still not breeding season. Breeding Waxbills need even more live food and grasses to support their rapidly growing chicks. Many will not attempt to breed until they have the extra foods available to them and on a regular basis. While most species are relatively easy to keep, they are all considerably more difficult to breed. Diet and housing aside, I'd like to talk about Waxbills as pets. Giving the proper living conditions Waxbills should start showing their personality and sense of adventure. My own Waxbills intently watch me clean the aviary every night and they are always the first to fly down and inspect my work. Because I have kept a fairly regular schedule with my finches the Waxbills have almost become friendly towards me. The small flock always greets me when I walk in. Usually because I'm bringing food and they all want to be first in line. Because most Waxbills can't be visually sexed I spend a lot of time watching them interact with each other. All the Orange Cheeks flick their tails back and forth; it's part of the non-vocal communication. Only the males will truly sing. They will also display their colors for the female while hopping around the perch. More often than not I have witnessed the hens leading the males around the aviary in a little cat and mouse game which seems to excite the males even more. Fighting is something I have rarely seen, but it does happen. Most of the fights never gets past the intimidation phase but when two males are determined to fight one will get tossed off the perch eventually. I have yet to see one pluck the feathers from a mate or an opponent. When it's time to stop playing and working out territory they get down to the business of breeding. The males will gather a little material and present it to his mate for her approval. Waxbills do pair off for breeding. Even though they are social birds who do flock together they will want some private space to raise a family. This is why having a large aviary or flight is so important. Many breeders simply keep their Waxbills in pairs. Keeping Waxbills in pairs only will also help you avoid the problems that can arise if you house species that don't normally co-exist together and usually results in fighting. Nail clipping is something you may have to do from time to time. Waxbill�s claws are always growing and can become overgrown very quickly. Most Waxbills I find in pet stores are in need of a little trimming, and mine also require it. 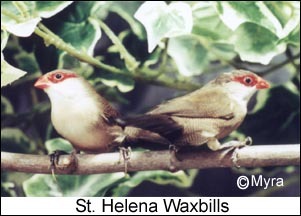 There are many species of Waxbill. Some you can find is most pet stores and others you would have to find a breeder to acquire. Appearance: Red beak, grey head, orange cheeks, fawn back, dark red rump, the lower parts light grey with a yellowish spot between legs. Appearance: Fawn to brown over all, lower parts lighter, red beak, red eye stripe, striped body, red patch between the legs. Appearance: Fawn is the primary color, lower parts are lighter, black beak, red eye stripe, greater coverts dark red, rump is a dark red. Appearance: Black cap, grey striped on the back, lower parts light grey to black near the tail, flanks and rump red, upper beak black, lower beak red and black. 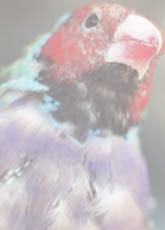 Appearance: Face and cheeks are black, body has a pinkish shade, back is striped, flanks and rump pinkish red, tail black. 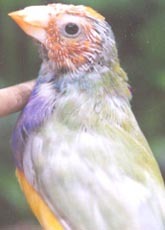 Appearance: upper parts green, lower parts yellow, belly is orange, red eyebrow, beak red with black. Females have less orange and lack the red eyebrow.